How does your CU's executive compensation compare with peers'? On average, credit unions with assets of $100 million or more budgeted for a 4.38% increase in 2016 for their highest-ranking executive. CEOs in these credit unions earn a median base salary (excluding bonuses and/or incentives) of $214,000—up from $207,000 a year ago. The median base salary increases as asset size increases, from a low of just more than $150,000 for CEOs in credit unions with assets of $100 million to $200 million, to a high exceeding $560,000 for those in credit unions with assets of $2 billion or more. 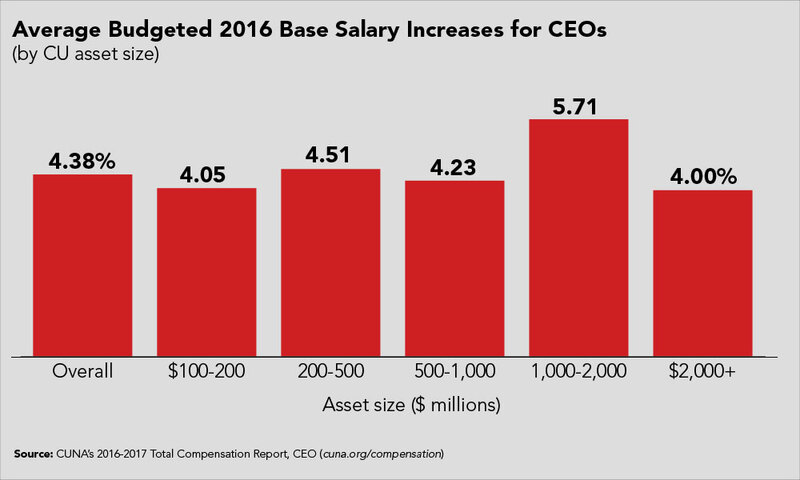 You can use CUNA's 2016-2017 Total Compensation Report, CEO to identify how your CEO's base pay, bonuses, incentives, and perks compare with those received by CEOs in similar credit unions. JON HALLER is CUNA's director of corporate and market research.